Verbatim Wireless Notebook 6-Button Deluxe Mice feature Blue LED technology, allowing users to navigate on virtually any surface, from a glass tabletop to granite countertop. Additionally, 2.4GHz wireless performance allows for lag-free cursor movement. The mouse connects to the computer via a nano receiver, small enough to plug in and leave connected - great for computing on the go. When not in use, the receiver stores conveniently inside the battery compartment. 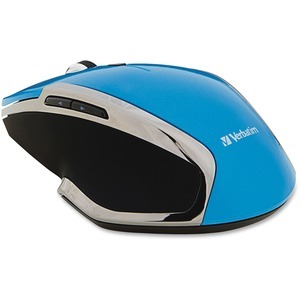 The Wireless Notebook 6-Button Deluxe Blue LED Mouse is backed by a 1-Year Limited Warranty.